This is a great way to support a charity of your choice at no cost or obligation to you. It provides an additional service to your customers and also a way to support the community and the environment. To participate, provide us with your name, address, contact information and which 501c3 non profit organization you want to support. CPS places boxes at retail facilities throughout the community. 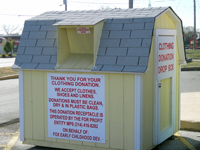 CPS provides, maintains the boxes and collects all items. If you wish, we will provide a quarterly statement of how much revenue your box generated for your non profit organization.